In this article we discuss residential forced warm air furnace heat exchanger life in more detail, explaining the factors that impact the life of the heat exchanger, things you should do to maximize the life of the furnace heat exchanger, and similarly, things you should not do because they are likely to destroy your furnace before its time. Here we also discuss provide: typical Residential Warm Air Heating Furnace Heat Exchanger Life. 13 Factors that Impact Residential Warm Air Heating Furnace Heat Exchanger Life. Should a Leaky Heat Exchanger be Repaired or Replaced? Table of Residential Heating Furnace Heat Exchanger Warranty Period. Furnace heat exchangers transfer heat from the burning fuel (typically LP gas, natural gas, or heating oil) into building air. In most designs combustion gases pass from the combustion source (oil or gas flame and combustion chamber) through the heat exchanger's interior tubing to an exhaust point that vents gases through the heater's flue and chimney (sketch at left). What happens if a heat exchanger leaks? 1. Safety: a leaky heat exchanger can be dangerous, risking carbon monoxide poisoning. 2. Cost: although it is possible to replace a leaky heat exchanger on many furnace models (not all), the labor cost and total cost investment in such a replacement in an older furnace is questionable enough that more often the ultimate cost is that of a new heating system. A while back at HEAT EXCHANGER LEAK TEST reader Marlin asked "what is the normal life of natural gas furnace?" to which we replied "Just about the warranty period - manufacturers know their equipment well; warranty periods run from 10 years to lifetime." But this was a bit too glib. Here we provide the details about the causes of leaks in furnace heat exchangers and about furnace heat exchanger life expectancy. Why do we care about leaky furnace heat exchangers? Furnace heat exchanger leaks may vary from trivial - even below the limits of detection, potentially fatal. Watch out: Dangerous carbon monoxide gas leaks (CARBON MONOXIDE - CO), potentially fatal, can be present intermittently depending on variations in heating system operation and building conditions. Actual risk of CO poisoning varies even when there is a leak in a furnace heat exchanger depending on where the leak is, its size, the fuel used (gas vs. oil) and other factors that we discuss in taxing detail in a companion article: HEAT EXCHANGER LEAK TEST. The top two most commonly-cited causes of leaks or failures of a forced warm air furnace heat exchanger are corrosion and metal fatigue. To understand the actual causes of heat exchanger failures in a bit more detail is to know how to reduce the risk of this potentially dangerous and costly defect. Adjustment of the furnace burner (oil or gas), fuel to air mixture, or combustion air defects: any improper operation that causes the furnace burner to run too hot or too cool can damage the equipment in a variety of ways: thermal fatigue, condensation, production of corrosive agents. Airflow restrictions: anything that slows the flow of building air over the furnace's heat exchanger risks subjecting that component to high temperatures, increasing metal fatigue and shortening the unit's life. Examples of airflow problems include dirty air filters, crushed, damaged air ducts, even improper original duct system layout and design. Beware of more subtle dirt that slows air flow such as a dirty squirrel cage blower fan - a component not normally included in furnace cleaning jobs. .
Greenheck points out that "Other than a corrosive environment, the airstream temperature rise is the largest factor driving heat exchanger material selection." Fan limit switch operation or any event that subjects the heat exchanger to abnormally high temperatures. For example, . if the fan limit switch is modified, damaged, or improperly adjusted then the heat exchanger can be subjected to a too-high operating temperature or it may be subjected to abnormally high temperatures if the blower fan shuts off too early at the end of a heating cycle. Gas pressure: in gas-fired furnaces, if gas pressure is too low the furnace heat exchanger may be subjected to excessive wet-time increasing corrosion in the unit. In oil fired furnaces improper burner adjustment may produce similar corrosive effects if soot combines with moisture. Heat exchanger materials: some warm air heaters such as some models of Rheem's gas furnaces using a stainless steel construction assert improved corrosion resistance and resistance to thermal fatigue  . Heat exchanger materials need to resist both corrosion and the effects of temperature cycling. Commercial and indirect-fired heat exchangers in some commercial equipment offer alternatives to steel: aluminized steel (the aluminum corrodes to form an aluminum oxide resisting further corrosion), and stainless steel (chromium content resists corrosion by a mechanism similar to the aluminized steel product). As aluminized steel approaches 1100Â°F the aluminum begins scaling, exposing the steel. This temperature corresponds to an airstream temperature rise of approximately 70Â°F. However, at temperatures below the aluminized steel scaling point, the aluminized steel tends to outperform stainless steel with respect to heat stress cracking. From this information, Greenheck recommends aluminized steel for temperature rises of 60ÂºF or less and stainless for temperature rises greater than 60ÂºF. For heating and ventilating applications and make-up air applications in mild climates where the airstream temperature rise is less than 60°F, aluminized steel will offer long furnace life and minimize the chance of heat exchanger stress cracking. Maintenance level & frequency of the heating system; regular cleaning & maintenance extends equipment life. Oil burner soot forms corrosives when left in place in the off-use season. Failure to keep the heat exchanger clean subjects it to higher temperatures, potentially damaging this key component. If the furnace is capped by a cooling coil, maintenance must assure that its condensate is properly handled and the coil kept clean. Moisture: exposure of the heat exchanger to moisture and thus rust: leaky humidifier, especially a humidifier or A/C drip pan located above the heat exchanger; humidifier or condensate leaks onto the heat exchanger, chimney leaks from condensate or actual water entry; a heat exchanger in a furnace located in a wet or damp basement or crawl space is at extra risk of rust damage & perforation. The heat exchanger is also exposed to extra moisture simply from condensation if the system has long off-cycles during the heating season. Corrosion occurs in the heat exchanger with the combination of water primarily with nitrogen and sulphur  to create sulfuric acid and other corrosives. Operating air speed: slower airflow around the heat exchanger may subject it to higher temperatures. With all of these, and given that the manufacturers have a greater database of experience than the rest of us (and keep actual performance a trade secret), I figure we should quote anticipated furnace heat exchanger life as about that of its warranty period, excluding exceptional events. I will research for any updates to our list of scholarly articles on the topic and will include them in our article. is evident when we see an add-on air conditioner evaporator coil atop an older furnace, questionable or leaky condensate handling, rust stains atop the furnace, and similar clues. 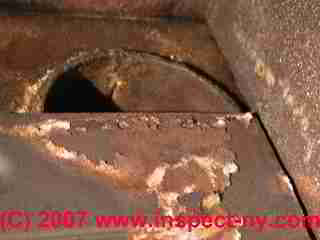 Inspecting inside the furnace below the A-coil or evaporator or cooling coil one might see actual rust damage to the heat exchanger. Even if damage is not immediately visible, don't assume that a visual inspection of the heat exchanger is comprehensive. It's not. At below left we illustrate a hole burned/rusted through the heat exchanger of an old oil-fired furnace. At below right we were concerned about the burned fragments in the left side of the photo. Our photo at below left shows variation in the gas flame of that furnace - a possible indicator of a heat exchanger leak. At below right we see what I call "exfoliating rust" (red arrow) that shows up in thick flakes or chunks - this is not superficial rust. Our blue arrow points to a pile of this rust debris beneath the gas burner in a furnace that was installed in a damp area - the heat exchanger is suspect even before a thorough inspection. Our two photos below show a severely rusted gas furnace interior, and our red arrow (below right) points to a severe crack in the heat exchanger. Should a Leaky Heat Exchanger be Repaired or Replaced? Just ask the equipment manufacturer. OK so everyone wants to sell you a new furnace or an expensive heat exchanger replacement. It's not just greed. No one wants to bear the risk of promising you that a repaired heat exchanger is safe. Our photo at left shows the heat exchanger in a new gas furnace we installed in a Poughkeepsie NY Home. We heard from folks describing repair attempts using high-temperature resistant epoxy, welding, and other low-cost solutions. MIG welding can avoid burning a big hole in the exchanger but if the welder is not an absolute expert the welding job may cause further metal fatigue and more heat exchanger cracking even larger than before; carbon monoxide gas is itself odorless and colorless; you may be depending entirely on carbon monoxide detectors for the life and safety of building occupants. Prach continues to describe the initial state of heat exchanger cracks as small, difficult to see, but growing ever larger as the heater goes through heating cycles. Adding welds, in my OPINION means adding stress points for future heat exchanger cracks. OPINION: I would not try to repair a furnace heat exchanger. If the furnace is generally in good condition and operates at a good efficiency but has suffered a cracked heat exchanger, one might consider a heat exchanger replacement when the cost of the total job is about half the cost of a new furnace and of course also if the furnace heat exchanger remains covered by the manufacturer's warranty. On older furnaces and non-factory warranty heat exchanger replacements we're left with some questions: is the new heat exchanger warranted? Is the work proper, complete, safe? Were the same furnace heat exchanger leak tests performed after the repair as before? See the back page of the installation manual for the heater. Or contact the company with the model and serial number data from the data tag on your furnace. Bryant.com 4/11/13 also see Carrier below. if properly registered in 90 days, else 20 years. Life or 20 years (model dependent); subsequent owner: 20 years. Watch out: most furnace heat exchanger warranties as well as overall product warranty require that you register your heating system within a limited time period after its installation, typically within 60 or 90 days. If you fail to register a more limited warranty of shorter duration may apply. Watch out: OPINION: product warranties including furnace heat exchanger warranties are sometimes more of a marketing tool than a reliable promise. The simple comparison of warranty terms such as number of years of warranty coverage does not reflect the ease or difficulty you may have actually making a successful warranty claim among various companies. For a comparison of the environmental impact and life variations of different types of heating & cooling equipment seen Shah (2008)  in our references. We include the text from historical articles on methods used for testing furnace heat exchangers for leaks, and the allowable or standards for heat exchanger cracks, holes, leaks, or carbon monoxide hazards from such leaks. Continue reading at HEAT EXCHANGER LEAK TEST or select a topic from closely-related articles below, or see our complete INDEX to RELATED ARTICLES below. HEAT EXCHANGER LIFE & WARRANTY at InspectApedia.com - online encyclopedia of building & environmental inspection, testing, diagnosis, repair, & problem prevention advice. If you can tell me the model and serial number of your American Standard heater (and the fuel it uses) I can probably find the warranty document. I will also add links to American Standard heater and HVAC equipment warranty information in the article above - you may need to clear your browser cache or it may take 24 hours for the updated page to appear on your server. Searching via several tools I did not find a specific report of any epidemic American Standard heat exchanger failures, though your installer may know something I couldn't find. Beware that some causes of heat exchanger failure can be due to an installation error. In such an instance, "all of them fail" may be true because "I install them all the same way" - perhaps. Note Regarding Heat Exchangers: If a heat exchanger fails because of a manufacturing defect within the sixth through twentieth year of the applicable warranty period, Company will, at its sole option, provide either a replacement heat exchanger without charge, or allow a credit in the amount of the then factory selling price of an equivalent heat exchanger toward the retail purchase price of a new heating unit. If you didn't register your heater with the company when it was installed, a basic warranty may still apply. Also see this American Standard HVAC warranty registration web page - or call for warranty registration: 1-855-260-2975. If possible I'd also like to see a photo of the heater and also any photo or documentation about the nature, location, and size of the heat exchanger crack or leak. Use the page top or bottom CONTACT link. Beware also that a cracked heat exchanger risks fatal carbon monoxide poisoning of building occupants - it's not something to ignore. Tests for heat exchanger damage are not entirely reliable, and visual inspections can be difficult as usually not all parts of the heat exchanger are visible. I've commented in this article series that depending on the size of a heat exchanger leak or crack and on where it is located, when the blower fan is running positive air pressure on the outside of the heat exchanger may blow air into the heat exchanger through the crack - so CO tests and smoke tests, depending on exactly when, where, and how they are conducted, can miss a cracked, unsafe heat exchanger. Of course there are other causes of heat exchanger damage and leaks including mechanical impact during transport or installation, and commonly, rust and corrosion from condensate or other water leaks or from equipment mis-adjustment.
. A crack in the Heat Exchanger was found and we were told that this is very common in that particular heater and that the installer knows this and continues to sell them. If we get them to replace the Heat Exchanger it can happen again. We don't know what to do. They never gave us a copy of the warranty. Any help would be appreciated. Thank you. Right, Viking, assuming that your direct vent heater is the type that combines a combustion air INTAKE along with the exhaust venting out. (Some systems take combustion air from the interior). If your system is return-air-starved, fixing that is very worthwhile. Recombustion air: system is now direct vent, so this shouldn't be a problem, correct? Thank you, will check search on HVAC return air improvement. If the B-vent had severe condensation I'd also check that the chimney was properly sized and routed and that there is adequate combustion air. No humidifier; run separate plug-in dehumidifier in summer. Concern is airflow back to furnace is not adequate. Furnace is in N corner of basement. Had issue with galvanized sheet metal B-vent of previous furnace rotting out probably due to condensation in B-vent, so a direct vent furnace was installed to replace. Good question, though I'm not sure of an authoritative answer to the choice you ask about. I would start by looking carefully to find the cause of the rusted heat exchanger. If for example there is a humidifier installed over the furnace that could be destroying whatever equipment is below (by leaks onto the heat exchanger) - it would be really annoying to install an new furnace and A/C system and see that destroyed again by the same problem. If you can get the heat exchanger replaced under warranty AND find and fix the leak that ruined it that might be most-economical. Have Trane XR90 (90% efficiency) in 11/2006. It is installed in a 1990"s home with 6-8 inch circular flexible ducts between floors and 14" foam ducts out of furnace to main floor. Since 2015, heat exchange has rusted, leaking in furnace. AC coils were installed in anticipation of AC, but finances and other events prevented compressor installation. Do I fix H/X under warranty and install AC with new coils OR install new multi-stage Trane 95% efficiency system + A/C? Concerned I will have same problems again with either solution. Modern times modern troubles. My daughter lives in a home built in 1932. Has an ancient HENDERSON CLIPPER fan forced furnace. All tested and good to go. Has been serviced regularly. Probably caste iron heat exchanger, built to last. On 2015-04-14 by (mod) Often the labor cost plus ending up with a repaired older system loses in comparison with the swap in of a new furnace. I agree Tony. Often the labor cost plus ending up with a repaired older system loses in comparison with the swap in of a new furnace. From a labor aspect, it seems it would be cheaper to go with Amana's full unit replacement than the labor cost to replace just the heat exchanger. Opinions? I had a boiler installed in 2002 and in 2012 there was a problem with the boiler. i had a 10 yeaar warrenty that wasnt horned and was charged a substainal amount to repair and replace parts. I felt the company didnt honor there warrenty and stopped paying the. now Im in court. what shall i do? Your article does not mention Lennox heat exchangers. We installed an Elite 12 Residential Packaged Gas/Electric unit. After the 10 year period the heat exchanger went out and we replaced it. However it was replaced just 4 years ago. That does not seem very long ago. Can you help me by giving me any further information. We don't know whether to replace it or buy a new unit. We are retired and on social security for our income and its a very large investment for us to consider. Danie. Thank you for that information. Will do some more homework. Hi Michelle, It's too bad about your furnace heat exchanger, though good that you learned about a potentially dangerous condition in time to avoid something worse! I would not waste a SECOND arguing about this, going to court, suing, or anything else before having a more accurate diagnosis of just what's wrong with your furnace's heat exchanger, or to be more clear, to understand what siort of hole is present in the heat exchanger, where the hole is located, and most importantly why it occurred. WHY? Because without simple, easy-to-understand factual evidence you'll waste time arguing while everybody points to others. THEN we can have an idea who's responsible for the equipment failure that in turn will give you some guidance on how you want to proceed. If the heat exchanger failed with a rust hole due to an improperly-installed humidifier that might be the installer's responsibility, though they'll blame you for not watching and maintaining the unit. If the heat exchanger failed because the whole unit was dropped and banged and damaged during shipping or installation that would produce, probably, a crack of particular characteristics. If the furnace heat exchanger failed due to overheating that may be due to an improperly installed, adjusted, or damaged fan limit switch - a switch problem that could have originated at the factory, at the installation, or over the life of the erquipment. If the heat exchanger failed with a perforation or crack that occurred during normal operation on a properly installed and maintained machine, that may indeed be something that ought to be covered by product warranty. In my OPINION unfotunately today too many warranties are more of a marketing tool used on the front end of selling equpment than a too, used to obtain customer loyalty by replacing a defective product (the manufacturer's warranty) or to maintain customer loyalty to a heating installer or service company (the installer's warranty that their work was correct). my 5 yr old Williamsom 25000 seer oil furnace has a hole in the heat exchanger. Williamson tells me its the installer and the distributor I should go after. The installer has told me that he doesn't own any responsibility! I am out over $4,000. What say you about the lowly consumer? Lawyer or small claims court? Should I keep the whole furnace as evidence or take photo's? Need answers soon. No heat in Ct! Thanks for the question - it prompted us to expand our original furnace warranty information in the article above. Hwa, C. S. "Mathematical formulation and optimization of heat exchanger networks using separable programming." In AIChE-IChemE Symposium Series, vol. 4, pp. 101-106. 1965. Kreider, Jan F., Peter Curtiss, and Ari Rabl. Heating and cooling of buildings. McGraw-Hill, 2002. Kuppan, T. Heat exchanger design handbook. Vol. 126. CRC Press, 2000. Abd El-Baky, Mostafa A., and Mousa M. Mohamed. "Heat pipe heat exchanger for heat recovery in air conditioning." Applied Thermal Engineering 27, no. 4 (2007): 795-801. Shah, Viral P., David Col Debella, and Robert J. Ries. "Life cycle assessment of residential heating and cooling systems in four regions in the United States." Energy and buildings 40, no. 4 (2008): 503-513. Abstract Heating and cooling systems consume the most energy and are the largest source of emissions in the entire life cycle of a house. This study compares the life cycle impacts of three residential heating and cooling systems—warm-air furnace and air-conditioner, hot water boiler and air-conditioner, and air–air heat pump over a 35-year study period. Simulation and life cycle assessment studies of the systems at four locations in the United States, namely Minnesota, Oregon, Pennsylvania and Texas determine the effect of regional variations in climate, energy mix, and the standard building characteristics on the systems’ environmental impacts. In Minnesota, Pennsylvania, and Texas, the heat pump has the highest impacts whereas in Oregon the heat pump has the lowest impacts. A second scenario shows that substitution by high-efficiency equipment reduces the impacts of all systems but does not affect the order of relative performance by region. Another scenario examined the replacement of coal-generated electricity by renewable generation in regional grids. In order to reduce the impacts of the heat pump system to the lowest of the three systems, renewable sources would have to replace 42% of electricity generation in Minnesota, 15% in Pennsylvania, and 38% in Texas. Nishio, Gunji, Susumu Kitani, and Kazuhiro Takahashi. "Thermophoretic deposition of aerosol particles in a heat-exchanger pipe." Industrial & Engineering Chemistry Process Design and Development 13, no. 4 (1974): 408-415. This article discusses the deposition of airborne particles and their impact on heat exchanger life and brittilization of the heat exchanger metal. High Performance Heating & Air, http://hphaa.com/picpages/101/heaterlife.htm, retrievedf 4/11/2013 10, 15, 20, 30 years, various reasons. Also see HEAT EXCHANGER LEAK ALLOWED where DeWerth determines the allowable level of flue gas leakage from a furnace heat exchanger. American Gas Association, Fundamentals of Gas Combustion, 7th printing, September 1985. Prepared by American Gas Association Laboratories for American Gas Association, 1515 Wilson Boulevard, Arlington, VA 22209 and Gas Appliance Manufacturers Association, Inc., 1901 North Fort Myer Drive, Arlington, VA 22209. NFPA and AGA, National Fuel Gas Code Handbook, Z223.2, same source as above. DJ Friedman (editor of InspectAPedia.com) served as a professional home inspector and forensic investigator of building failures from, 1986 to 2010. He previously operated a heating and cooling service and repair company and a residential construction and renovation firm. Sensidyne Corp. 12345 Starkey Rd. Suite E, Largo, FL 33453 813/530-3602. Sensidyne does not sell retail. Their equipment is marketed by Industrial Products Company, 21 Cabot Boulevard, Langhorne, PA 19047 800-523-3944 or in PA 800-562-3305. This distributor also can supply GasTec colorimetric tubes used with the Sensidyne calibrated pump. Draeger equipment is marketed to home inspectors by Kirsopp Home Inspections Inc., Belleville, IL 618-397-3057. GAS EXPOSURE EFFECTS, TOXIC Toxic Gas Exposure Hazards and Test Protocols including links to our toxic gas exposure screening and gas testing protocols. Domestic and Commercial Oil Burners, Charles H. Burkhardt, McGraw Hill Book Company, New York 3rd Ed 1969. National Fuel Gas Code (Z223.1) $16.00 and National Fuel Gas Code Handbook (Z223.2) $47.00 American Gas Association (A.G.A. ), 1515 Wilson Boulevard, Arlington, VA 22209 also available from National Fire Protection Association, Batterymarch Park, Quincy, MA 02269. Fundamentals of Gas Appliance Venting and Ventilation, 1985, American Gas Association Laboratories, Engineering Services Department. American Gas Association, 1515 Wilson Boulevard, Arlington, VA 22209. Catalog #XHO585. Reprinted 1989.